Musicians Amanda Palmer and Damon Krukowski discuss the transition from analog to digital recording and what's been lost in the process. Such was the prescription from indie musicians Amanda Palmer and Damon Krukowski ’85 during an animated discussion about digital creativity Tuesday night at the Carpenter Center for the Visual Arts. Krukowski, who came to the Consumer Research Center/store to kick off the tour for his new book, “The New Analog: Listening and Reconnecting in a Digital World,” used “noise” to describe the ambient sounds such as air conditioning or breathing that found their way onto analog audio recordings, but he was also speaking of life in the pre-digital world before social media giants’ content streams. 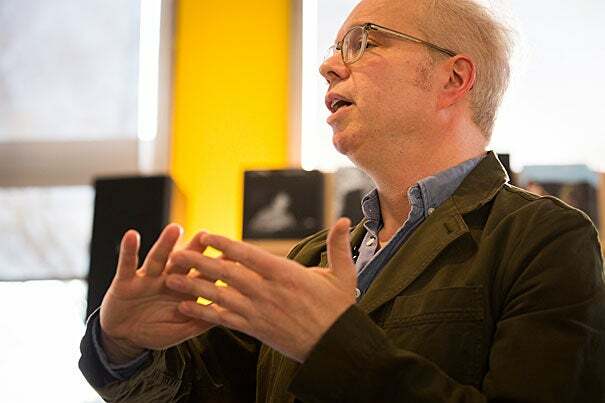 Krukowski, who was the founder and drummer for Galaxie 500 in the late ’80s, worked on the idea of analog versus digital as a fellow at the Berkman Klein Center for Internet & Society in 2015-16. By eliminating noise, he argued, digital technology has isolated authentic sound, though he hoped the debate would not be seen as old versus new, or good versus bad. But Palmer, a rock ’n’ roll performer who has cultivated an intimate relationship with fans on and off social media, wasted no time lamenting the loss. Instead, she commiserated with Krukowski over a shared displeasure with Facebook. She quoted from Krukowski’s book: “Social media have no content to offer other than what their users provide. Yet that information, too, is limited to isolated signal as defined by the platform — a neat trick.” Then she made her own supporting argument. “I also hate Facebook, and I hate Facebook more and more every day,” she said, bemoaning the algorithms it uses to determine what is signal and what is noise for its 2 billion users. “Noise is necessary. If we’re going to stay human, visual, audio, emotional noise, it’s what makes life. If you don’t have it, you don’t really even have the conditions for living. If things are signal only, that literally means there is no room for coincidence, synchronicity, kismet, randomness — the things that make life feel realistic,” she said. Palmer, who has a 2-year-old son, Ash, shared a tale of value added by noise. She recalled a car drive from New York to Boston with Ash in the back seat while she played a Nick Drake CD. She asked Krukowski his advice for solving the noiseless conundrum, and he suggested less uniform channels of communication such as Bandcamp, an online music store that helps independent artists share and sell their music. Palmer traded the likes of Spotify, Pandora, and iTunes for Patreon, a subscription content service. “I’m very fortunate because I have 10,000 fans who have given me their credit cards. That’s amazing,” she said, noting that her current business model, though digital in form, reminds her of the earliest days in music when people played in a room for their community. Dancers Jill Johnson and Christopher Roman will perform choreographer William Forsyth's “Catalogue (First Edition)” to kick off a two-day celebration of the choreographer and the discipline in the Widener Library Rotunda.